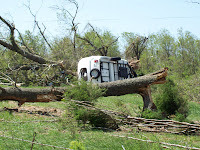 Thought I'd share a few pictures of some of the tornado damage sustained to our little town. This is what I could see of my parents home when I arrived. 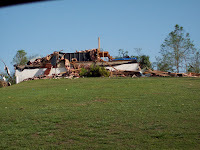 The home of a family friend, what is left of it. Not sure who's vehicle this is or where it came from!! 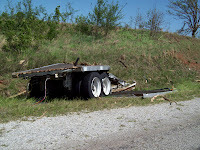 This partial semi-trailer is sitting along Hwy 59. No sign of the other half of the trailer or the truck that was pulling it. The remains of a 2 story brick church. 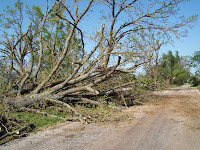 Please be much in prayer for all those that lost loved ones in this terrible storm, those that are dealing with the loss of their homes and all those that are still hurting. It's going to be a long healing process for this area. Just a parting thought, I heard this on the radio on the way to the airport. "God is the bearer of all great gifts, even those that are wrapped in pain." Sometimes it is very difficult to see beyond the pain however good will come out of the pain! !